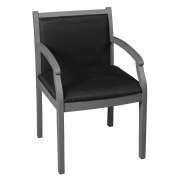 Hertz Furniture offers guest chairs in a variety of styles and colors to suit every need. What kind of chairs should you get for the lobby? 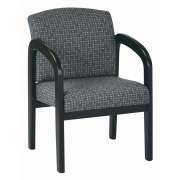 If you want to maximize a small waiting room, choose practical yet comfortable modular guest chairs. 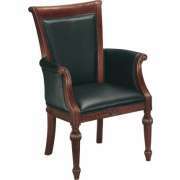 If you are looking to add some flair to your reception area furniture, captains chairs can greatly enhance your decor. Waiting doesn&apos;t have to be unpleasant. 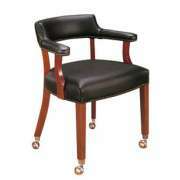 When you order great reception chairs, you show clients, colleagues and employees that you care about their comfort. Having a cozy place to sit will make any wait, appointment or meeting experience a much more pleasant one. How can I keep visitors to my office comfortable? The key to seating comfort is ample padding that is made from a cushy material. 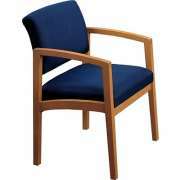 Our guest chairs offer great support so everyone can sit cozily in your office or reception area. Be sure to check the specifications to see just how thick the seat and back padding of the reception chairs you are considering is. The more comfortable your visitors are, they less they will notice the time passing. No matter who is coming to see you, anyone can appreciate having a few minutes to sit down and relax in a cozy waiting room chair during a busy day. Which style of chair is best for my waiting room? 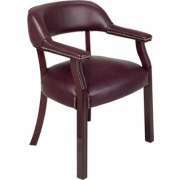 Ideal office guest chairs shouldn&apos;t just feel great, they should look great as well. Besides thinking about padding thicknesses, it is important to consider what the chairs will look like in your space. Appealing frame and upholstery materials will greatly enhance the feel of any lobby. Many of our guest seating choices are available in a wide selection of fabric styles and colors so you can choose upholstery that coordinates with your decor and preferences. Lobby chairs offer a great way to bring some new hues into a space without making any drastic changes. Upholstery comes in either vinyl or fabric. Vinyl has a similar visual appeal to leather, but is much cheaper. It is easy to wipe down for cleaning purposes, and won&apos;t rip easily. Easy cleaning is ideal for a company that serves children or any kind of medical facility. Fabric has a softness and pliability that creates cozy seating. Patterned fabrics add some flair and originality to your space. 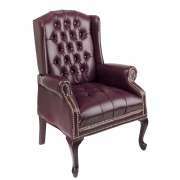 What is a captains chair? 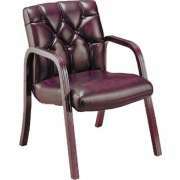 Style is an important feature of waiting room chairs. 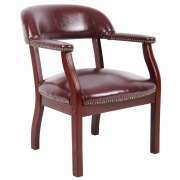 To furnish an accounting firm or law office, you might want to consider classic tufted captains chairs. These imposing pieces project an air of authority, experience and expertise. For a media company or PR firm that wants to create a young, up-to-date feel, modern style is probably a better option. 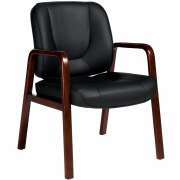 New-age-style office reception chairs can give a company a contemporary image that will appeal to trendy young clients. 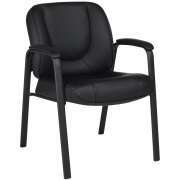 Do I need visitors chairs in my personal office? 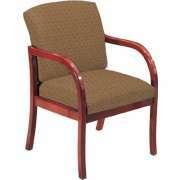 Guest chairs aren&apos;t only for waiting areas and executive offices. 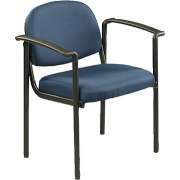 High-profile professionals often host personal meetings in their offices, so they also need to have some comfortable elegant reception chairs in their personal work spaces. Guest chairs should be coordinated with other office furniture for a uniform appeal that exudes a sense of order and organization. To get a perfectly-matched office, you can order office reception chairs that is part of the same office furniture collection as an office desk and other pieces. This arrangement is ideal for a stately work space. What should I look for in reception chairs? 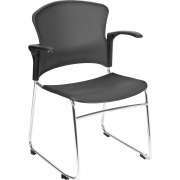 While style is important, user-friendly features must be considered as well in any office guest chair purchase. 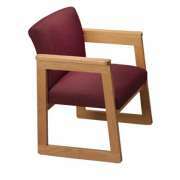 Mobile guest chairs offer flexibility and easy transport. Stacking chairs are good for a space that is used for a number of different purposes because they are easy to setup and cleanup. They will give your guests permanent comfort, even when they are only being used temporarily. 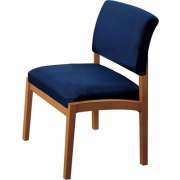 Guest chairs are available both with and without armrests. Chair arms offer a classy way to separate individual seats. They also provide extra support to your guests. 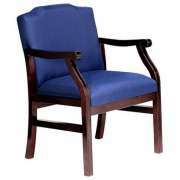 Club chairs have cushy armrests that will really give your guests proper treatment. If you are more interested in fitting as many chairs as possible into the space you have, armless models are a better choice. 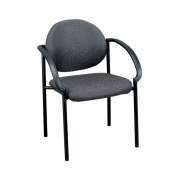 Hertz Furniture&apos;s guest chairs are designed to project professionalism and provide comfort. 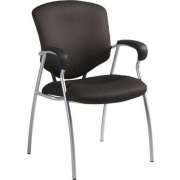 They come from high-quality office furniture manufacturers including Lesro, Regency Seating and OFM. If you need help determining how many chairs will fit in your space or deciding what the best style for your reception area is, contact the Hertz Design Center.